Welcome to La Paz and my home at Villas La Posada. Below is information to help you get to know La Paz and the accomodations at this beautiful complex. My Villa is Number 006. Please feel free to call me if you have any questions! You can pay by personal check, Pay Pal or credit card. a half block from the Villas La Posada complex. This unit is located on the ground floor of the complex providing direct access to the pool and Jacuzzi area. This Villa has two large bedrooms, each with a queen size bed and two full bathrooms each with a large walk-in shower. The kitchen is fully equipped with all modern amenities to make you feel as though you are in your own kitchen. For those of you who like to cook, you will also have a 15 bottle spice rack to use! In addition to this beautifully decorated Villa, you will have access to other outdoor amenities to include an outdoor cooking and eating area next to the pool. “The Palapa” offers a large gas grill, full size refrigerator, sink, bathroom, tables and chairs for dining and/or cocktails. All guests also have access to the rooftop terrace and hot-tub of the “Tower” – which offers beautiful views of the Bay, the city of La Paz and spectacular sunsets. There is a large grocery store within walking distance from the complex. 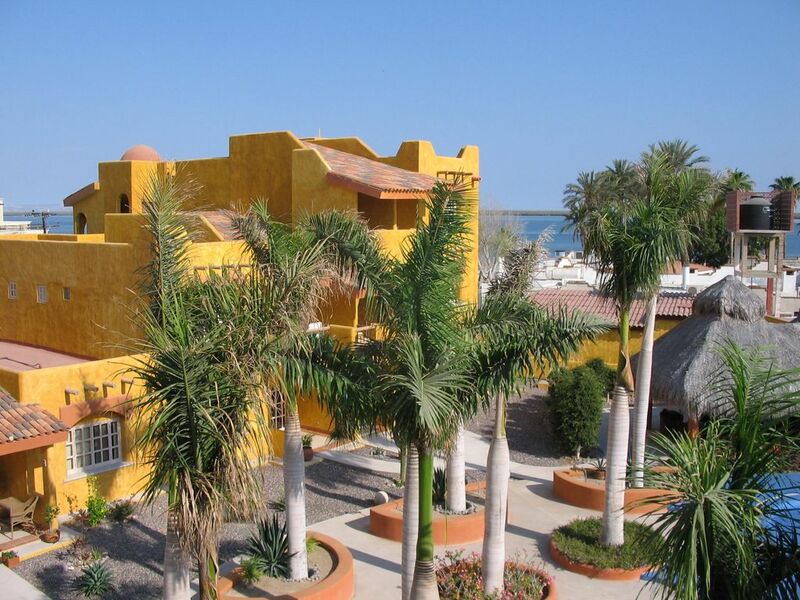 Access to the Malecon and La Paz’s downtown area is extremely easy and just a short drive away. The Malecon offers a beautiful waterfront walkway, where people jog in the morning and stroll in the evening, and seaside restaurants and shops. Lea was kind enough to stay in town to greet me in person on Christmas Eve, which was a sweet and welcome gesture after a long drive from the airport. Her home is beautiful, clean and comfortable. I safely walked back and forth to the commercial district, even at night, though it's maybe just a tiny bit too far after a few cervezas because there are no restrooms along the way. ;) I highly recommend lunch or dinner at Oliva al Mare, a gorgeous restaurant along the Malecon; stand-up paddle boarding at Playa de Balandra (get there early); and day trips to Todos Santos and El Triunfo. Thank you, Lea, for sharing your lovely casa with a solo gal from Seattle! Loved this beautifully decorated ground floor condo. We were there, (2 older couples) for 5 nights. Everything we needed plus more was there. Only used the air conditioning the first night, after that we left the windows opens and made use of the floor fans when needed. Spent most of the time by the pool or on the lanai. Excellent security and friendly groundkeepers. 2 grocery stores are within walking distance and the restaurant at the hotel next door was excellent. Driving in La Paz was easy, just watch out for the oneway streets. Communication with Lea was fast and courteous. Loved this place. We actually recommended it to 2 other couples at our next hotel. The villa was terrific. We used the grill and the swimming pool everyday and it was very enjoyable for myself and my children. We would like to stay again in the future! Enjoyed our stay at this very well equipped condo. Main floor condo with walkout to pool. Security on site 24hrs a day. Kitchen has everything you need to cook at home. Has mini splits for AC if you require them, we just let wind blow through when it warmed up. Used the hot tub almost every night, just make sure you turn it on early to circulate the heat. Lea's place is exactly as described. It had everything we needed- fully equipped kitchen, laundry, towels, beach chairs, wifi etc. The condo is clean and has a great living area with doors to an outside sitting area in the courtyard, which also has a swimming pool. Lea is an amazing host, very responsive and super helpful. She even booked us a dinner reservation for Christmas day at a fantastic restaurant. We loved the location of the condo, which is right by the beach. We walked from the condo to the Malacon but it is a bit of a walk. We highly recommend this place and would stay there again for sure! I am so happy you enjoyed your time in La Paz and that my Villa worked out so well for you. It was a pleasure getting to know you over email and it would be a privilege to share my home with you again in the future. The condo was perfect! It was very clean and well provisioned. Thank you so much for sharing your home with us. Merry Christmas! opportunity to explore all that La Paz has to offer. La Paz is the capital of California Baja Sur and a University town. This city, which is full of historical, cultural and culinary attractions, has managed to maintain an authentic small town ambiance. beaches, whale watching, scuba diving, snorkeling, sea kayaking, seabird watching, sailing, swimming with the sea lions at Espiritu Santo, hiking or mountain biking in the Sierras, to name a few. Explore the historical and cultural attractions of La Paz. Also, if learning the Spanish language is of interest to you, there are schools in La Paz that will help you improve your proficiency in this beautiful language.